Western Digital have released a range of hard disks that are optimised for the common network-attached-storage device. You may think that you need to use a regular desktop hard disk for this application but the WD RED range can suit this space in a more reliable manner. These 3.5” SATA HDDS are set up for 24/7 operation yet have reduced power needs. Their software even is optimised for this class of device by assuring quick response and high compatibility across most NAS enclosures. But I also would reckon that they would suit those large USB / eSATA hard-disk subsystems that are commonly used with USB file server devices like the Freebox Révolution or one that was part of a home network that I helped someone with. Compared to a desktop or mobile hard disk that has to deal with reduced duty cycles or a high-end server hard disk that is optimised for intensely-active corporate servers with large power allowances and many-spindle disk arrays, these are optimised for a small NAS that has a small power supply that provides power to up to five spindles. WD aren’t just selling these 1Tb-3Tb hard disks with their MyBook Live NAS products but making them available as disk units for use with diskless NAS or USB enclosures. 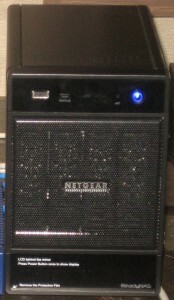 This also applies to those of us who buy a multi-bay NAS enclosure like a NETGEAR ReadyNAS with one disk, then add hard disks to this enclosure as needs, funds and time allow. They also have support for proper AV streaming which would be required of most NAS subsystems used in the home as DLNA Media Servers or “NVR” subsystems used in small-business IP-based video-surveillance setups. This would cater for a glitch-free audio or video recording and playback experiences. A good question I would ask is whether the competing manufacturers like Fujitsu and Seagate would answer WD when it comes to providing the hard disks optimised for these small network-attached-storage systems.